Hard to determine the effectiveness of BroccoMax I just hope it decreases chances of cancer like studies suggest. 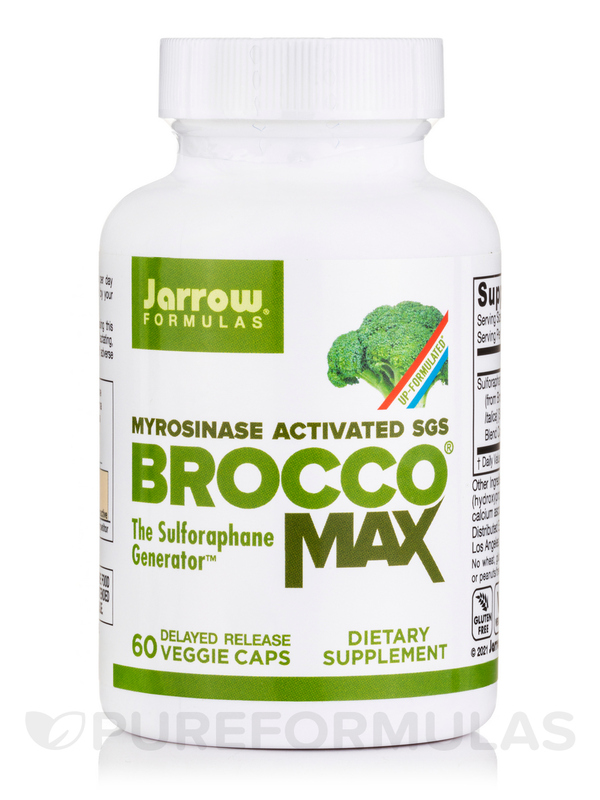 BroccoMax by Jarrow Formulas was always excellent, but now improved since the sulforaphane is myrosinase activated. Recently began using BroccoMax by Jarrow Formulas at the recommendation of my naturopathic oncologist. So far so good. 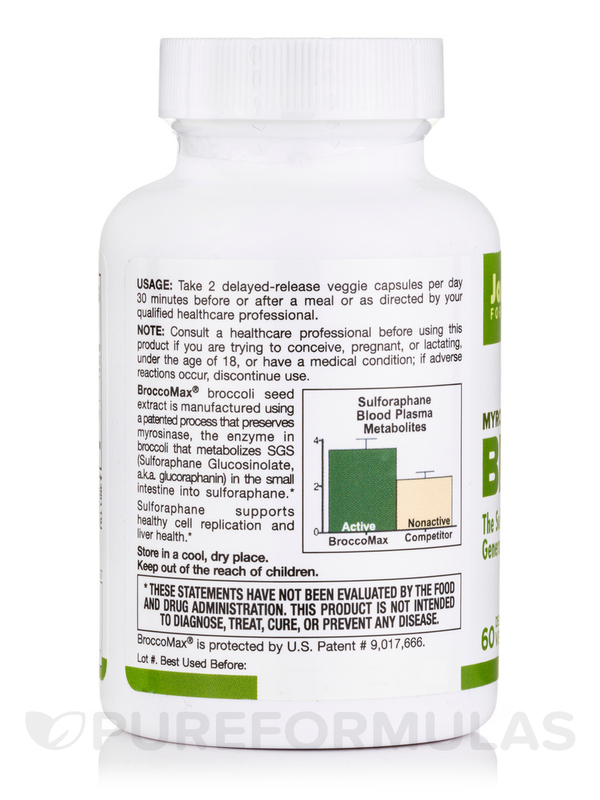 BroccoMax® Vegetarian Capsules from Jarrow Formulas® may stimulate the body’s phase-2 detoxification process and support healthy cell replication. Broccoli falls under the category of cruciferous vegetables and might be rich in antioxidants. 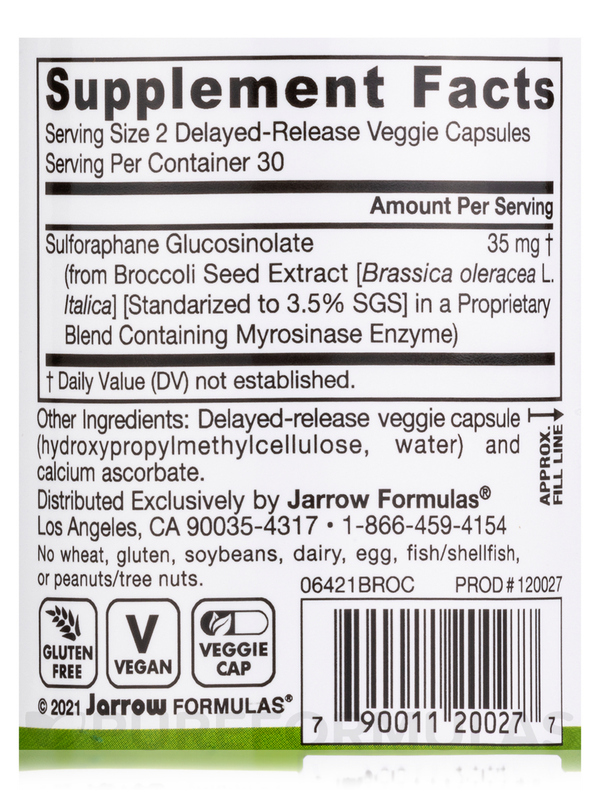 This supplement from Jarrow Formulas® contains a standardized concentrated form of sulforaphane glucosinolate‚ which is obtained from broccoli seeds. Broccoli is rich in three forms of glucosinolate‚ glucoraphanin‚ gluconasturtiian‚ and glucobrassicin‚ all of which may support the body’s detoxification process that eliminates unwanted toxins. Sulforaphane is a chemical found in certain cruciferous vegetables such as broccoli‚ cabbage‚ and cauliflower. It has antioxidant properties and could stimulate the natural detoxifying enzymes. It may also be able to reduce high blood pressure and cholesterol. Sulforaphane glucosinolate might have the ability to induce the phase-2 detoxification and also protect DNA from damage caused by free radicals. BroccoMax® 60 Vegetarian Capsules from Jarrow Formulas® is suitable for vegetarians and vegans and is free of wheat‚ gluten‚ soybeans‚ dairy‚ eggs‚ fish/shellfish‚ and peanuts/tree nuts. 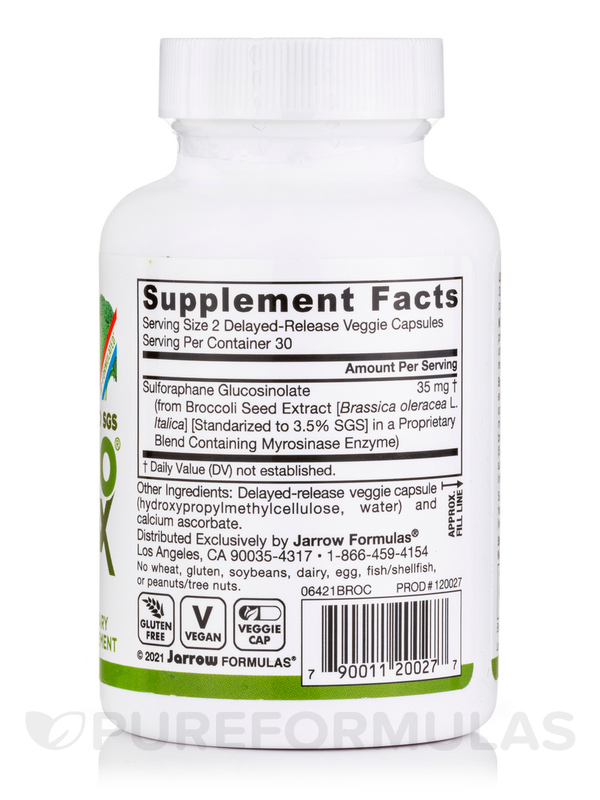 (A proprietary blend of sulforaphane glucosinolate‚ SGS [aka glucoraphanin]‚ and myrosinase enzyme from de-oiled broccoli seed powder plus calcium ascorbate). Other Ingredients: Maltodextrin‚ silicon dioxide and calcium ascorbate. DRCaps® consist of hydroxypropylmethylcellulose. Take 1 to 3 delayed-release capsules (DRcaps®) per day 30 minutes before or after a meal‚ preferably dividing the capsules evenly among meals‚ or as directed by your qualified healthcare professional. BroccoMax by Jarrow Formulas is much easier and safer than growing broccoli sprouts. Glad that PureFormulas carries it, because its hard for me to find locally! I feel like I can breathe better and my stomach feels calmer after taking BroccoMax® by Jarrow Formulas. It helps to lower estrogen. 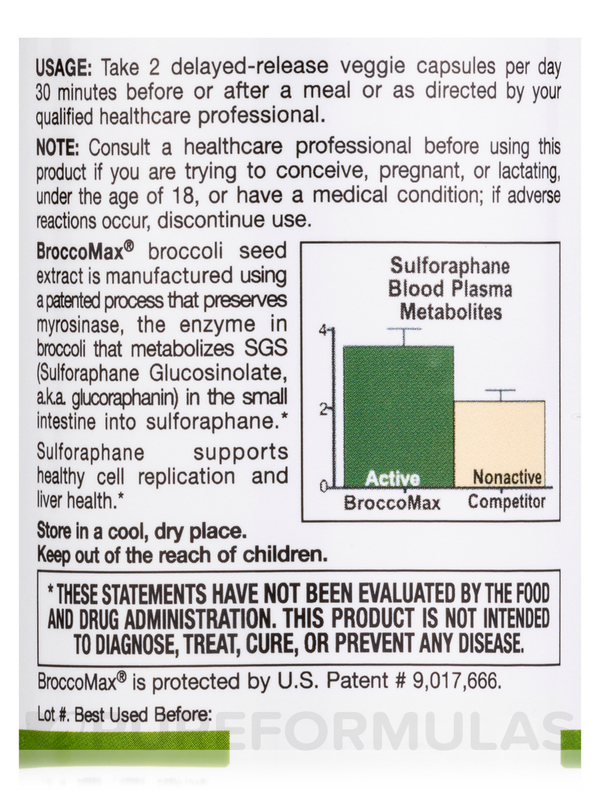 I bought BroccoMax by Jarrow Formulas as an autism treatment after some studies posted good results with Sulforaphane. One big issue is getting a sensitive child to take it. The capsules are mostly too big however the powder inside is not extremely chemical tasting or smelling and can be easily put inside regular food. It has a mild smell and taste of brocolli and a salty dusty like texture. A word of warning when mixing, Sulforaphane is very sensitive to heat and so should be put into luke warm foods/drinks. No chemical smell or taste. I purchased BroccoMax to give to my mom for her recent chronic congestion health regime. I heard broccoli is good for you and this seems to be better than relying on steamed broccoli by itself. I taste-sampled the powder in a capsule and it seems to taste like broccoli or like celery seed. Only slightly herby. Would probably recommend although it is early. Studies sound reasonable regarding detox factors. Good brand. Pleasant product unlike cabbage extract. I ordered BroccoMax about 1 month ago and started taking it right away (about 3 weeks). I ordered it because I was looking for something to help my COPD. Im on oxygen almost 24 hours a day and want to be able to cut this down considerably maybe even cure my condition. I found BroccoMax just by surfing the internet. I cant give a significant review yet. Too soon. Nothing at this time. I really cant recommend it to a friend because Ive had no results yet. I was looking for something that had a higher level of sulforaphane and BroccoMax has it. I sprout my own broccoli sprouts but I like to supplement with this. It works for me!